After having done lots of QSOs with the 7MHZ QRO transceiver I found that the receiver still had to be improved. The sensitivity was great, the sound also was but there were some difficulties when operating the radio during evening and night times because some (minor) interference was audible. This symptom had been caused, as usual, by strong broadcast stations transmitting from 7200+ kHz 41m-band. Occasionally “Radio China International” and “Radio Romania International” were discernable. But cure was on the way: The transceiver has a modular concept. Based on this I decided to do a full reconstruction of the receiver module. 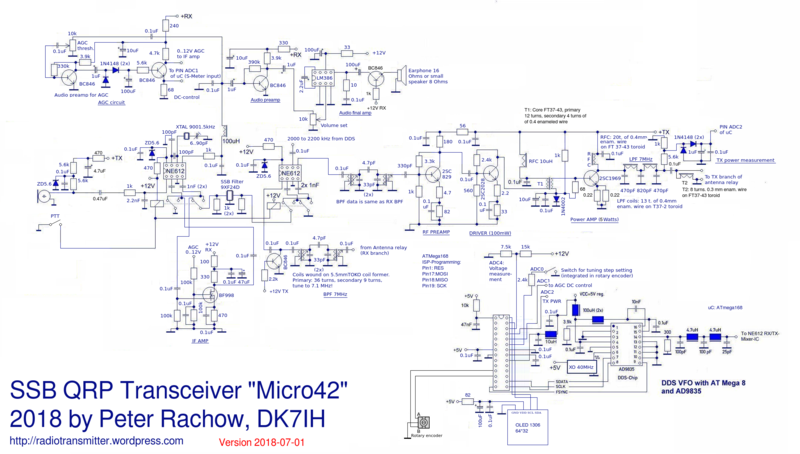 The mixer, which is the most crucial part in a 7MHz receiver was changed to an IC mixer using an SL6440 double balanced mixer (formerly produced by Plessey). The mixer IC offers a very good IMD3 performance (30dBm maximum according to datasheet) plus some decibels (1 to say exactly!) of gain and thus is a good alternative to the dual-gate MOSFET I had used before. As a special feature there is an input (pin 11) where a current can be applied that determines the overall mixer current. The higher this value is set, the better the IMD3 performance will be. Max. power dissipation for the IC is 1.2 watts but that will require a heatsink. I found that a resistor of 820Ω will lead to a current of 4mA (13V VDD) on pin 11 line and produces good performance without thermally stressing the IC. For optimized IMD3 performance the SL6440 ic should be run in balanced mode. From the left we start with a two pole band filter for 7 MHz. LC coupling again is very loose what reduces the receiver’s tendency to overload. Next is the SL6440 mixer ic. Input and output are equipped with broadband transformers (data see schematic, please!). The purpose is to convert an unbalanced signal to a balanced one and vice versa. According to the respective entry in data sheet running the mixer in balanced mode enhances performance. Pin11 is used to control the DC operating conditions of the mixer, a resistor (820Ω) sets appropriate bias for mixer stage. The 3 diodes (1N4148) supply correct voltage to a pin that is called “VCC2” which should be slightly lower than VCC supplied to the output stage. 3 diodes in series produce the required voltage drop. 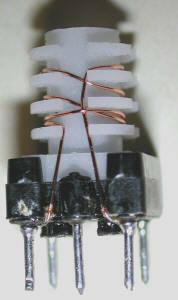 In experiments it has turned out the even when gain of the mixer ic is only about 1 dB the resulting output of the whole receiver is higher than that of its predecessor and taking into account that receiver generated noise is not a problem on the lower short wave bands, there is no rf preamplifier. If you encounter birdies maybe the signal level of the VFO is too high. Then switching a smaller capacitor into the VFO signal feedline is the best idea. Next stage is the filter switch that has been copied from the previous schematic. This stage contains the well-known MC1350 by Motorola. To simplify this section a minimum design has been chosen, Output is unbalanced and broadband. Input also. The only filtering in the whole interfrequency section is done by the SSB filter prior to the interfrequency amplifier. A 100uF capacitor in VDD line helps to suppress audio frequency feedback and self-oscillation in the receiver strip. As you might have realized the transceiver not longer is a “NE602 free zone”, because this mixer now serves as a product detector. A type of usage where the low IMD3 performance does not matter. The low pass filter by the end of the mixer must be chosen according to the user’s preferences concerning pitch and tone. Audio preamp is again an ic, the “antique” LM741. Negative feedback has been set to an amount that there is significant gain in this stage (R=330kΩ). The audio final amp here has been equipped with the TBA820M integrated circuit, the smaller version of the 16 pin TBA820 integrated audio amplifier. The advantage of this ic compared to LM386 is lower distortion and the fact that this ic is not so prone to self-oscillate. Maximum gain reduction (>60dB) occurs between 6.7 and 7 volts. Also a manual method to reduce gain has been applied. This is by chosing a voltage between 0 and 12V using a potentiometer. To prevent current flowing from the center of the potentiometer into the ADC input detecting the AGC voltage a silicon diode has been installed. To prevent a short circuit of the AGC voltage against GND when the potentiometer is at 0 position (delivering full gain in the MC1350 amp ic) the 5.6k resistor is used. Changing time constant can be achieved by a second capacitor set in parallel (either by a switch or by microcontroller). To protect the analog-digital-converter (ADC) in the microcontroller from excessive input voltage, this is limited to 5.1V by a zener diode. The receiver is very sensitive. Reception is possible with the famous “wet finger” ;-). With a large antenna (full sized delta loop) no overload is detectable even during evening and night times. Noise is slightly higher compared to that with the MOSFET equipped receiver but very much acceptable for a 7MHz receiver. 73 and thanks again for watching!